I love pizza and this particular variation is something I don’t get to indulge in too often so I figured it was time to give it a try for myself — so I can be able to treat myself whenever and at anytime. 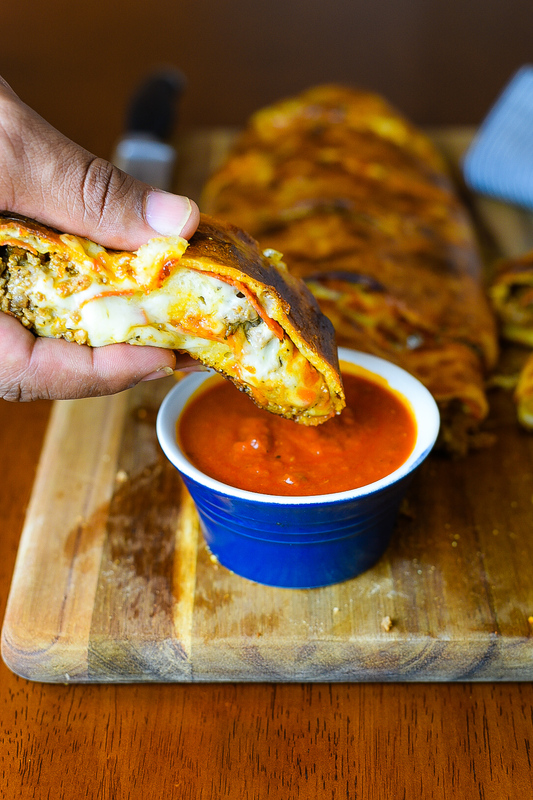 The Stromboli is a very flavor-filled “turnover” that is loaded with lots of cheese and your choice of Italian meats, vegetables and anything else you can think of that will make it special for you. It is rolled similar to rolling a burrito which creates a multi-layered effect resulting in layers of dough falling nicely in between layers of cheese and meat. 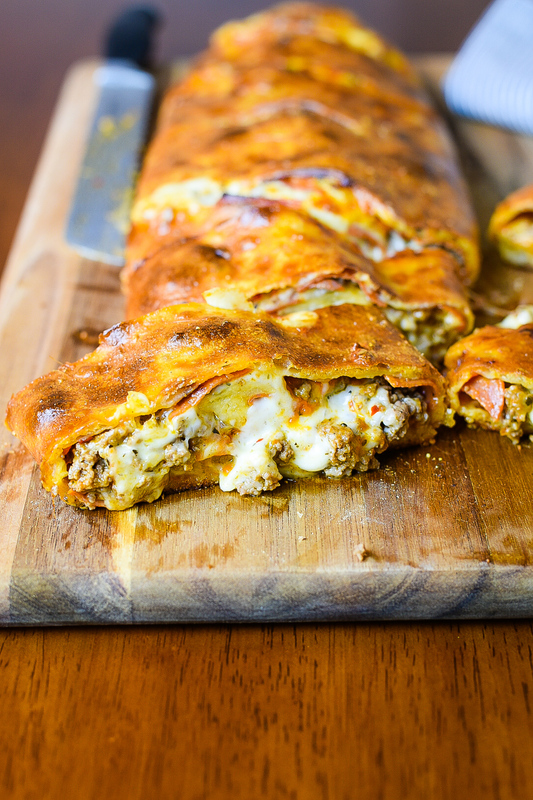 Today I bring to you my version of one of my favorites called the Italian Beef and Pepperoni Stromboli. There isn’t much difference in the taste so I used turkey pepperoni, but you can definitely use traditional pepperoni instead. 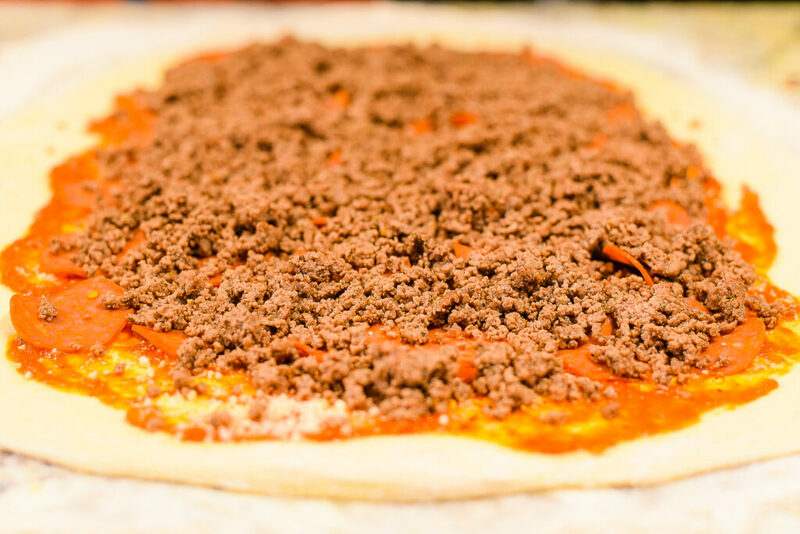 Add that to the ground beef and Italian seasonings — the combination just never gets old. I am officially a cheese head so using a pound of cheese is a must! This recipe takes a little patience because you want to make sure your dough doesn’t stick to your surface when you start the rolling process. My trick is to keep the pastry flour on hand. 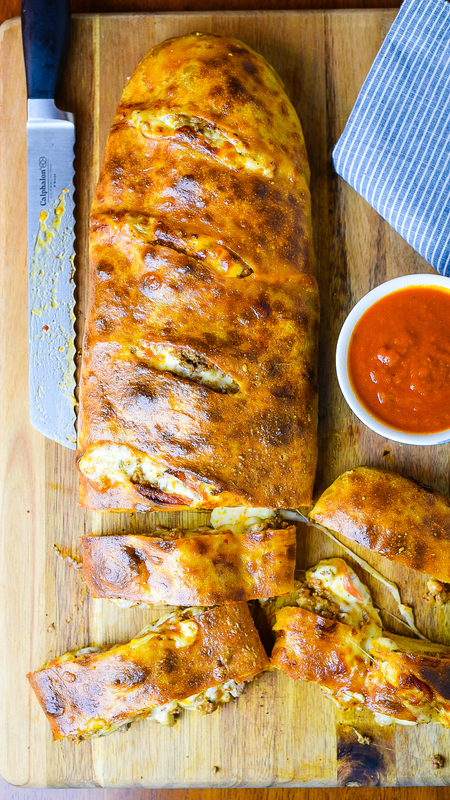 When a regular pizza pie for pizza night just won’t do and you want to make an impression, add this Italian Beef and Pepperoni Stromboli to the menu. 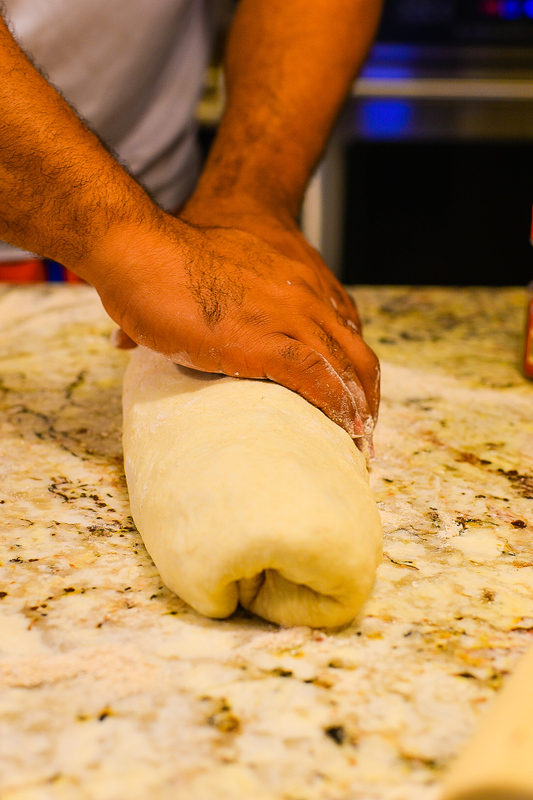 Spread pastry flour over kitchen counter top. Place fresh dough onto flour and begin to shape dough into a rectangle using hands. Finish shaping and flattening with roller. Pre-heat cooking pan to medium heat then add ground beef and season beef with Italian seasoning, sea salt and black pepper. Cook meat until brown, drain excess grease and set to the side when done. Add marinara sauce to the pizza dough spreading evenly then top off with grated Parmesan cheese and red pepper flakes. Spread 3 ounces pepperoni over the sauce then add the cooked ground beef evenly. 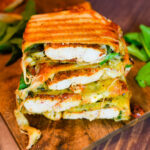 Add 12 ounces of the mozzarella cheese over the top of ingredients. Top off with the remaining pepperoni and mozzarella cheese. Spread the basil flakes over the top of the cheese. Fold the width ends slightly over the edge. Roll the dough up like a cinnamon roll and pinch the edges to seal and fold where the seam is. Lay the Stromboli seam side down. Add the cornmeal to the bottom of the baking pan and place the Stromboli on top of the cornmeal. Add egg and 1 tsp of water into a small bowl and whisk. 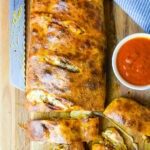 Brush Stromboli with the egg and cut small slits in the top. Pre-heat the oven to 425 degrees and cook the Stromboli for 20 minutes. Remove from oven once done and serve with marinara sauce. Love the sound of this rolled pizza. It’s interesting that it has an Italian name but is an American recipe which I read was named after the 1950 film Stromboli! Still, def something I’d love to try! Yes I agree it is pretty interesting. I can eat this daily lol. This sounds delicious. Perfect for football watching. Thanks Anne! This is a great game day meal. 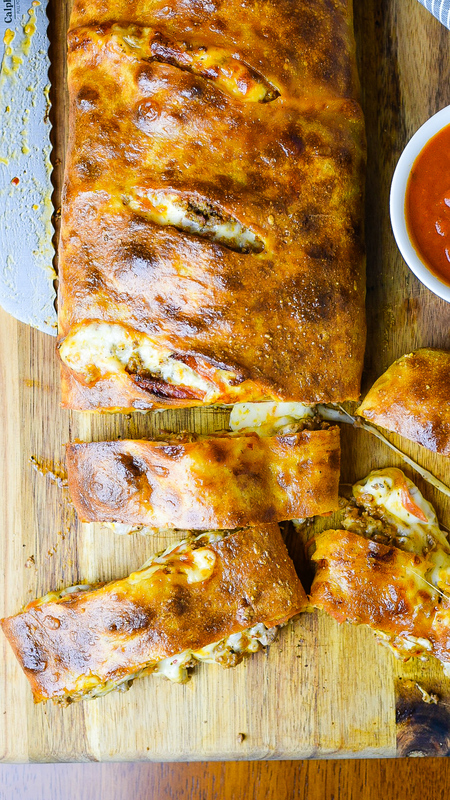 I love stomboli so much more than pizza and this one looks like PERFECTION… especially that crust… spot on! Thanks so much Catherine. I appreciate it. OMG…perfect recipe from a regular country boy. Cool thanks so much Stefani! !